Your water heater is as essential part of a fully functional home or business. If the hot water heater fails, such tasks as taking a shower, cleaning, and washing dishes can become difficult and even miserable. If your are noticing any issues with your water heater, short supply of hot water, not hot water, or water heater leak, we are Midwest Plumbing can help. We can replace or service your water heater so you can get back to them hot showers. When you rely on Midwest Plumbing for water heater repair or water heater replacement, you can expect professional service from a skilled plumber. Midwest Plumbing offers 24-hour emergency water heater service, so you will have hot water again as quickly as possible—the same day in most cases. If a replacement water heater is necessary, a Midwest Plumbing water heater expert will help you determine which one is right for your home and budget, taking into consideration your family’s water heating needs and energy usage expectations. Most any type or brand can be installed, including a tankless water heater. Conventional water heaters store water in a varying size tank. Electric or gas energy is utilized to maintain the water at a set temperature until a faucet is turned on and water is pulled through the pipe. A conventional electric or gas water heater should last about 11 years. Newer conventional water heaters are more energy efficient than older models. A high-efficiency model can reduce water heating bills by about 7 percent. A tankless water heater is generally more energy efficient as it heats water on demand. When the tap is turned on, the heater kicks on to supply a continuous supply of hot water. A tankless water heater requires less space and can hang on a wall, but may require larger gas lines, special venting or additional electric circuits which all add to larger upfront costs. However, a tankless water heater has a longer life expectancy of 15-20 years and could reduce heating bills by up to 30 percent. Solar water heater systems use the sun to generate hot water. Solar water systems are either passive or active. Passive solar water heating systems are cost less, but are also less efficient. However, passive systems can be more reliable and may last longer. Active solar water heating systems utilize pumps and controls to circulate water into the home. Most solar water heating systems require a well insulated storage tank and a backup system for cloudy days and high water demand. 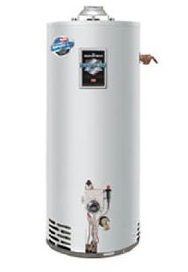 Your water heater is a very important component of your home or business. If you find yourself without hot water, call Midwest Plumbing at to schedule a free estimate.